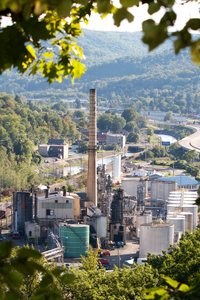 Submitted by: American Refining Group, Inc.
BRADFORD, Pa., Jan. 16 /CSRwire/ - A fixture in the Tunungwant Valley for decades, the American Refining Group Inc. (ARG) boiler stack was demolished last summer. A $5.5 million investment replaced the refinery’s only remaining coal boiler in 2016. The company commissioned its new, environmentally friendly and compliant boiler that fall. All three of ARG’s massive boilers are now fired by cleaner, more-efficient natural gas, leaving no further need for the iconic stack. Significant planning across all of ARG was required to prepare for the major demolition project, particularly ensuring that all appropriate safety and environmental-protection measures were in place from the start. Visible for years from so many vantage points on all sides of the valley, it felt to some community members like the end of an era. Regional reaction to news of the flue stack’s demolition was so strong, company leaders came up with a way to both assuage the local nostalgia and give back to the community. “It was fascinating to hear from people all over the country who were interested in having a piece of what was – to those who do or have lived and worked here – really a memorable and even iconic structure,” Schoenecker said. Bricks from the chimney were made available for a suggested donation of $5 to the McKean County Community Foundation. All proceeds and, perhaps most importantly, awareness generated by the event benefited the recently established McKean County Community Foundation’s general Fund for the Future. More than $1,000 was raised for the foundation from bricks that would’ve otherwise been disposed of. For more information about the MCCF, visit https://tinyurl.com/yb7lmcy9, send an e-mail to mccf@zitomedia.net, call (814) 834-2125 or follow the foundation on Facebook. For more information about ARG, visit www.amref.com or follow the refinery on Facebook and LinkedIn.